If you’ve followed Live Be Dallas for even the shortest while, you know that I have a killer sweet tooth. You may also have noticed, I can cook. But, I also have something to admit – I am self-aware that I can’t bake. I don’t have patience for measuring, waiting, refrigerating, rising, tempering, blah blah blah (I just can’t even). So, I decided to work on it for 2015 – and boy am I glad I did. Working sweets into a healthy and balanced diet is something I am all about. I went researching recipes from all the baking goddesses, i.e. Ina, Martha, and Julia. After deciding on a cinnamon cake recipe from Martha Stewart, ole Marth’ and I got to work. 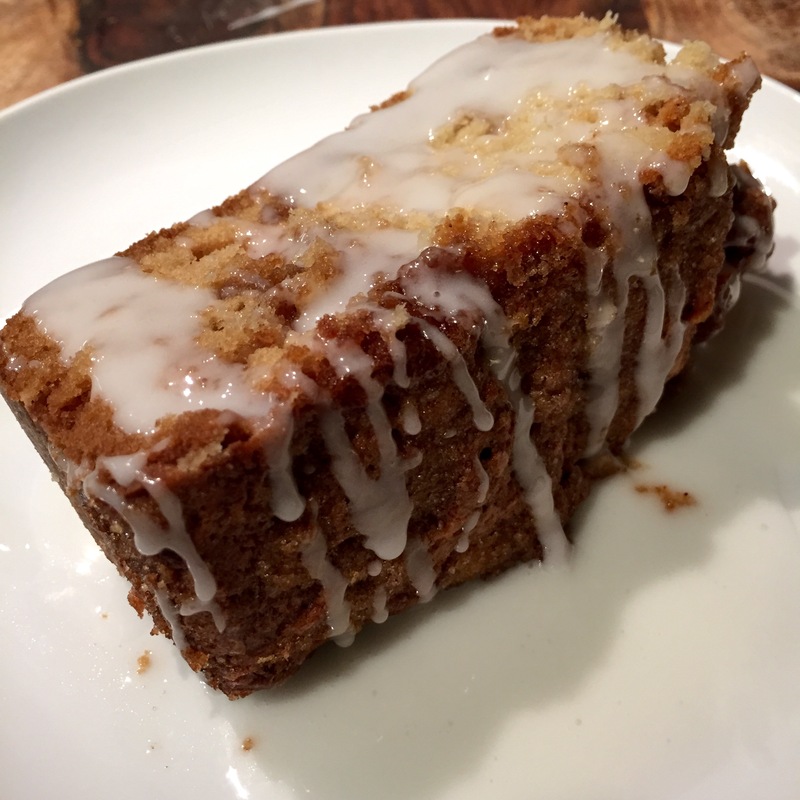 The outcome is a decadent, rich and dense cake that tastes just like a cinnamon roll! The streusel topping and center make you think you’re eating a Cinnabon cinnamon roll (the nostalgic value of Cinnabon is intoxicating). To take the cake to the next level, you drizzle the cake with a glaze that will send your taste buds twerkin’ right out of your mouth. Pro Tip: Serve warm – ideally fresh out of the oven. Make the filling: Combine brown sugar, cinnamon, and cloves in a medium bowl. Stir in granulated sugar, flour, and salt. Using your hands or a pastry cutter, cut in butter until combined and mixture is crumbly; stir in nuts. Transfer to the refrigerator until ready to use. Spray a 10-inch Bundt pan (or other tube pan with a 3-quart capacity) with cooking spray; set aside. Make the cake: Sift together flour, baking soda, baking powder, and salt into a bowl; set aside. In the bowl of an electric mixer fitted with the paddle attachment, cream butter and granulated sugar until light and fluffy, about 4 minutes. Add eggs, one at a time, beating until well combined. Beat in vanilla. Add reserved flour mixture and sour cream in alternating batches, starting and ending with the flour; beat just until combined. Spoon half the batter into prepared pan. Make a well in the center, and crumble two-thirds of the streusel mixture into well. Spoon in remaining batter, smoothing top; sprinkle with remaining streusel. Bake until golden brown and a cake tester comes out clean, about 1 hour. Transfer to wire rack and let cool 45 minutes; invert cake onto a wire rack set over a rimmed baking sheet. In a medium bowl, whisk together confectioners’ sugar and milk until combined; set icing aside, cover with plastic wrap, until ready to use. Drizzle over inverted cake; serve.